Your family North Myrtle Beach vacation will be better than ever at this North Myrtle Beach resort because Beachwalk Villas has an exquisite array of amenities. From the game room and fitness room to a covered swimming pool and another, oceanfront, swimming pool, this resort is a favorite in the Cherry Grove section of North Myrtle Beach, South Carolina. Beachwalk Villas is an oceanfront resort that is on both sides of North Ocean Boulevard. There are nine stories of condominiums at this North Myrtle Beach resort and they are on the west side of the street. From your North Myrtle Beach vacation rental you will be right across the street from the white sandy beaches. One of two swimming pools at Beachwalk Villas is on the ocean side of the street giving you easy beach access and fantastic views of the Atlantic Ocean. This ocean view North Myrtle Beach resort features North Myrtle Beach condominiums that have either two bedrooms and two baths or three bedrooms and three baths. There is so much room in each of these North Myrtle Beach condo rentals. With the private bedrooms and sometimes a sleeper sofa in the living room, these condos in North Myrtle Beach, SC can accommodate between six and 12 people for a memorable North Myrtle Beach vacation. All of the Beachwalk Villas condominiums have a well equipped kitchen that will make you feel right at home. There are full-size appliances, a breakfast bar and a dishwasher in these kitchens. The great room floor plan allows your family to be relaxing in the living room, playing games at the dining table and preparing a snack in the kitchen and still be part of the conversation. Additionally, these North Myrtle Beach condo rentals have a washing machine and clothes dryer so you can do laundry during your North Myrtle Beach vacation without thinking twice. Televisions and at least one DVD player are also provided for your use in the Beachwalk Villas rentals. Some units at Beachwalk Villas feature a Jacuzzi tub so you may take a long, hot, sensuous soak after playing 18 holes of golf or walking around the nearby outlet malls and wearing out your feet. The North Myrtle Beach vacation rentals at this North Myrtle Beach resort either face the ocean or have side views of the Atlantic Ocean and the salt marsh from their balconies. It doesn’t matter which North Myrtle Beach rental you choose at Beachwalk Villas; your family will be able to see the white sandy beaches and the ocean. The balconies are furnished so you can enjoy spending time outside reading, resting or visiting. Take pictures of the landscape and do a little bird watching with a pair of binoculars as you enjoy the scenery from your private balcony at Beachwalk Villas. Beachwalk Villas has two swimming pools. One of these fabulous pools is located on the oceanfront sun deck. Splash and play under the sunshine and only steps away from the beautiful sandy beach. 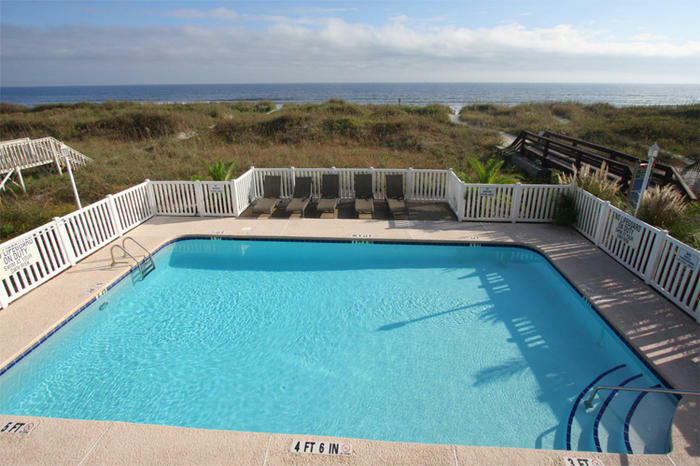 When you take a dip in this refreshing swimming pool you will just be right across the street from your accommodating North Myrtle Beach vacation rental. Your family will be able to see if you from your private balcony if you choose a North Myrtle Beach condominium at Beachwalk Villas that faces the Atlantic Ocean. The oceanfront pool is not the only swimming pool on site at this North Myrtle Beach resort. Look on the ground level of Beachwalk Villas and you will find a bright blue pool located in the shade. Next to this covered swimming pool is a hot tub. Indulge in this water feature when your muscles feel a little tired from playing so hard on the beachfront. Riding Sea Doos in the ocean work your shoulders more than you can imagine and sitting in a hot tub after such an activity is most delightful. Fitness enthusiasts will appreciate the exercise room that is on site at Beachwalk Villas. Get in a quick workout during your North Myrtle Beach vacation or start each day of your beach vacation with some weight training. It is a good thing there is a fitness room at this North Myrtle Beach resort because the food in the area is delicious and you will likely be tempted to indulge in rich soups, succulent seafood and decadent desserts. Burn off those calories in the Beachwalk Villas exercise room. Play games on the beachfront and in the game room at this North Myrtle Beach resort. Gather the family together for an evening of air hockey or Foosball. These family-friendly games will help create more North Myrtle Beach vacation memories. A parking garage at Beachwalk Villas not only makes it convenient to reach your North Myrtle Beach condominium from your car, but it also protects your vehicle from the occasional rain shower that might happen during your vacation.